On December 6, 1900, Alphonse Desjardins, opened the first cooperative loan and savings society (Caisse populaire), or people?s bank, in North America. By the time of his death 20 years later, Desjardins had been personally responsible for the establishment of over 200 Caisses throughout Québec, Ontario, and the United States and was considered a world-leading authority on cooperative financial institutions. As parliamentary stenographer, Desjardins heard a debate that changed forever the orientation of his life. On April 6, 1897, Michael Quinn, M.P. for Montréal-Ste-Anne, submitted a member?s bill that would prohibit usurers from charging outrageous interest rates to desperate people. Quinn cited one recent example whereby a man had to pay $5000 to cover the cost of a $150 loan taken to save his family from destitution. He realized the case was strikingly similar for thousands of French Canadians and he resolved to find a cure for the financial woes besetting the agricultural and labouring classes of Québec. Desjardins? cooperative pooled the resources of the agricultural and labouring communities in each parish into a local ?reserve? fund. Membership was open to all members of good moral character, and included women and childrens. Money could be borrowed only for good reason and productive purposes (loans were decided on by the locally elected administration). In 1911, he was invited by the Governor of Massachusetts to speak at conferences on mutual aid (during this trip he opened up the major caisses in New England). In 1912, he was invited by the White House to address American governors on agricultural credit. Governments and local groups in three Canadian provinces and 22 American states invited him to discuss the principles of cooperation in their jurisdictions. For many people all across the world today, the name ?Desjardins? means compassion and caring in financial matters that concern ?ordinary? people. 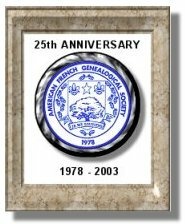 The American-French Genealogical Society is honored to include Alphonse Desjardins as a member of the AFGS French-Canadian Hall of Fame, Class of 2003.